The United States is the most powerful country in the world roughly based on economic, military and foreign affairs capabilities. The US has a diversified and capitalized economy and with its greatest soft power, leads the world in military, finance and business, high technology, the movies and higher education. The Economy of the Unites States tremendously influences and leads the global economy. The United States economy is often accepted as the "engine" that drives the world economy and the nation is adequately equipped for global power projection. New York City is the financial center of the United States and the world. The vast coastlines on the Pacific Oceans, the Atlantic, and on the Gulf of Mexico; several rivers; and inland lakes are the source of bountiful resources and offer one of the world's largest maritime transportation system. These water navigation has played a pivotal role in the economic growth of the US. The economy of the US was badly effected by the global financial crisis of 2007-2008 with very low output potential. The nation made a gradual recovery in the later half of 2009 and managed to bring down the unemployment rate. The United States has always been a forerunner in science and innovation. It has been regarded as the birth place of many Greatest Inventions, such as the aeroplane, microchip, internet, laser, refrigerator, cellphone, email, personal computer, microwave, LCD and LED technology, assembly line, air conditioning, supermarket, electric motor, bar code, ATM etc. The country is ranked among the world's top 10 in per capita GDP (nominal) and per capita GDP (PPP) and also has high median household income. The financial markets of the US is one of the world's largest markets and is tremendously influential to the entire world. Based on market capitalization, the New York Stock Exchange, undoubtedly by far, stands as the largest stock exchange in the world. The nation's foreign trade policy is well organized and developed. There are great deals of foreign investments made in the US and also the nation has invested huge amount in other foreign countries. Due to its geographic advantages, the United States has bountiful natural resources with a well structured infrastructure, one of the world's biggest trading and manufacturing nation. The US has high productivity and is ranked the 3rd largest oil and natural gas producers in the world. It is a home to many large companies of the world and several companies have their headquarters in the United States. The US companies are leading in technological advances, such as in medicals, computers, aerospace, and military equipments. The United States because of its size; massive large scale industries; and vast transportation system, is the second largest consumer of energy in total use. The country's extensive transportation network has the highest rate of energy consumption. Fossil fuels are the main source of the nation's energy. The whole country's energy needs are obtained from petroleum, natural gas, coal, nuclear power and renewable energy from hydroelectric dams. The income and wages offered to the employers reflect the well being of a country's economy. The worker's strength and their productivity are some important factors to consider to help review the economic growth rate of the country. The United States has witnessed all throughout, a steady growth in the labor force. The US employment rate has risen to a great extent since the last financial crisis of 2007-2008. The largest employment sector of US is the government sector, and small businesses providing employment to the maximum Americans. As far as the private sectors are concerned, around 91% of the citizens of the US are employed in the private sectors. Among OECD nations, the United States has the highest average employee income. Under the United States legal law, the country does not assure any paid vacation, paid family leave or paid sick leaves to its workers. The United States Department of Commerce manages the income of the United states by individual or household. Income inequality has hiked to a greater extent in the US, with a considerable difference in individual and household income. Based on a survey done bu US census, it has been recorded that nearly half of the population of the country lives in poverty or are low income earners, while a fraction of the population earns considerably high income. In the United States, wealth is generally measured in terms of net worth, which is the totality of all assets along with the market value of real estate, minus all liabilities. There is a huge financial inequality highlighted in the American population. The top 20% of the richest Americans own 85% of the country's wealth. International trade which comprises of the core activities of international imports and exports, is one of the most vital economic markets in the world. The foreign trade of the United States is extremely stable and the nation is among the world's top 3 trading nations. The United States Court of International Trade and the United States International Trade Commission internally administer the United States foreign trade. The United States Court of International Trade is functioning to resolve any disputes within the international trade community, among individuals, nations etc,. The United States International Trade Commission is an independent federal agency of the US that offers all trade knowledge and expertise to the legislative and executive branches of the government. All import related issues and its impacts are analyzed by the agency and also offer fair trade practices and direct actions are taken up against foul trade practices. The major percentage of funds circulated across the globe in international trade are United States dollars. The United States maintained trade agreements with many international trade organizations, namely World Trade Organization, Security and Prosperity Partnership of North America, and Organization of American States. The primary leading economic sector in the United States is the services sector and it highly contributes to the GDP of the nation. The service sector encompasses major sectors such as information, scientific, retail, technical and professional services. Among the service sectors, wholesale and retail; finance and insurance excel in the business and economic market. The New York Stock Exchange is the largest stock exchange in the world. Both the federal and state governments regulate banking in the United States. The United States has already established a benchmark in financial services, telecommunications and information technology or IT. The growth of IT, especially information products and services, is the country's huge land mile of economic achievement. The real estate and financial sectors of the US have struggled to grow immensely after they had been worst hit by the recent global financial crisis. The largest banks in the United States by assets include - JP Morgan Chase, Citigroup, Goldman Sachs, Bank of America, and Wells Fargo. The United States leads the world in industrial sectors. The industrial sector in the US is technologically advanced and sophisticated with expansive manufacturers and products. Its manufacturing output is greater than the turnover of many leading countries combined together. 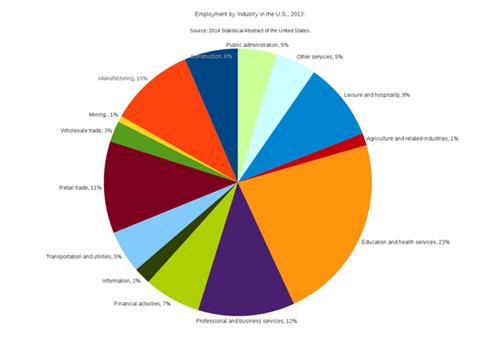 The leading industries in the US include petroleum, motor vehicles, steel, aerospace, chemicals, telecommunications, electronics, consumer goods, lumber, food processing and mining. The industrial sector is also one of the major employers of the nation. American industry is diverse comprising of many small scale as well as large scale sectors. Some of the American industrial companies which are included among the world's leading companies are the American firms General Electric, IBM, Exxon, Ford Motor Company, Philip Morris and General Motors. The United States is the leading manufacturer of airplane in the world. The airplane manufacturing contributes immensely to US industrial output. Many internationally recognized American companies, with factories spread across the US, such as Boeing, Cessna, General Dynamics and Lockheed Martin are the major manufacturers of civilian and military aircraft of the world. The US manufacturing companies are accountable for almost half of all country's exports and trades. The foreign companies in the United States also invest huge amount in the US manufacturing and provides employment to many millions of people. The moderate climate and fertile soil favor the nation's massive crop production annually. Agriculture comprises of very less percentage of economy of the United States, but the country is the major exporter of food across the globe. The country manages to produce surplus agricultural products because of the availability of many acres of arable lands, moderate climate coupled with the uses of high tech agricultural machines that make farming comparatively easier and efficient. There are also many acres of land available for grazing livestocks. The National Institute of Occupational Safety and Health maintains safety and health care services for the farmers to protect them from injuries and health hazards that may be caused from exposure to harmful chemicals and heavy machinery. The agricultural statistics of all the products are maintained by the National Agricultural Statistics Service, while the livestock statistics is maintained by the United States Department of Agriculture (USDA). The United States by far is the leading producer of corn and soybeans in the world. Other major crops grown in the country are hay, wheat, cotton, sorghum, rice, tomatoes, potatoes and lettuce. The United States major livestock industries include dairy cattle, beef cattle, pig, poultry and sheep. An economic overview on the agricultural activities of the nation revealed that, food is considerably cheaper and affordable in the United States as compared to any of the other developing countries in the world. Also, the United states farmers are the most productive in the world's agricultural history. The ERS farm income and finances program is a program that measures, highlights and overviews the economic performance for the United States farm sector, and important crop and livestock farm groups. It also administers and reviews all net income; receipts and expenditure of the farm sectors to help recognize the financial position of the various sectors. According to survey, it has been recorded that one in three farm acres in the United States is planted for export. Annually, an approximate 23% of raw farm products of the US are exported. The American farmers have also contributed immensely in livestock raising and have offered habitat for wildlife to help preserve the wildlife population. Most American farmers extensively follow crop rotation. Dating back since the last 19th century, the United States has already proved its worth in technological innovation and scientific research. There are several world renowned American personalities whose contribution in the field of research, development, and entrepreneurship have remarkable impacts to the whole world. Some of the few names to mention among the many personalities are Alexander Graham Bell (patent for the telephone), Thomas Edison (developed phonograph), the Wright brothers (developed the first heavier-than-air powered flight), Steve Jobs and Bill Gates (renowned American entrepreneurs). The tax system in the United States is progressive i.e., as the taxable base amount increases, the tax rate increases. The United States has a complex tax system which involve several levels and methods of taxation. Taxes are collected at many different levels, by the federal government, the state governments, the local governments and other special-purpose government bodies. Taxes in the US are levied on income, property, estates, payroll, sales, dividends, capital gains, imports, gifts, and various fees. Tariffs or customs duties are imposed on imports of goods in the United States. The custom rules are enforced by the United States Customs and Border Protection (CBP). The duties levied may vary according to the country of origin and product. Depending on the trade agreements, custom duties are exempted on goods imported from certain countries . The duty must be paid at the time of import by the importer of record. Irrespective of the source, certain types of goods are duty free. Customs rules are different from other import restrictions and one must abide by the rules, failure to do so may result in forfeiture of goods and may charge criminal penalties against the defaulters. Internal Revenue Service (a division of the Department of the Treasury): Administers most domestic federal taxes. Alcohol and Tobacco Tax and Trade Bureau (TTB): Administers alcohol, tobacco, and firearms taxes. U.S. Customs and Border Patrol: Administers custom duties or export taxes.